Made a last-minute edit to my entry. It should now make sure that the top card runs out a bit more often. 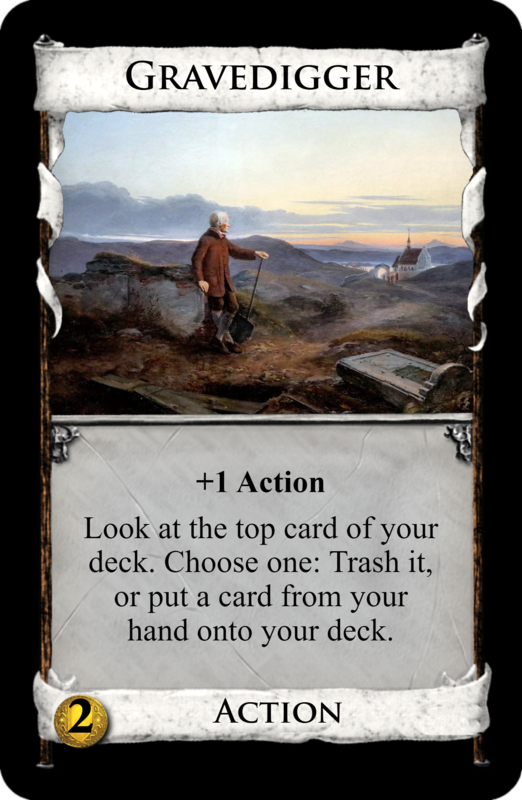 For Gravedigger: What happens to the card from the top of my deck that I am looking at if I decide to not trash it? Does it get discarded, go back on top of my deck along with a card from my hand, or into my hand and then I place a card onto my deck? Time has flown, and so has the opportunity to put in entries. Night, $3 trash card from hand, gain card up to $1 more/Action, $4 reveal top 3 cards, Nights into hand and discard rest, when you trash this gain gold. Dynamite can change estates into more Dynamite, so the top can empty quite quickly. Dwarf can find dynamite easily, and can be good Dynamite fodder if not played. I can see it being better as fodder, so the whole pile has a building purpose. Should be good fun, but I wonder if Dynamite couldn't also target non-Copper things in play to make it a bit more exciting, and help justify it as a Night card a bit more? Night, $3 +2 Actions return to Action phase/Action, $4 +buy draw to 6. I'll get straight to the synergy here. Bear can give you two more Actions after playing a terminal, instant CotR, so it's really strong with terminal draw. Bull being draw to X is extra strong with playing Treasures first before the Bear, and there is potential to draw things you just bought. So a bit scary power wise, though it takes some effort to pull off repeatedly. Night, $2 for each unused Action choose between trash card from hand and gain card up to $1 more or extra card for next hand/$5, +3 Actions + $2. Circus can do dynamite if you have Actions left, which works well if you chose not to play Actions so they're still in hand, or Estates into circuses. This combines well with the draw so the card can both build and draw the deck but at a slow pace sensible for a $2. Performers do everything they need to do, being nice things to draw in a big hand with Circus whilst helping Circus out too. The synergy is great, though possibly Circus is either a bit too niche to reliably empty or the whole pile empties for being too good with BM (you eventually build up massive hands with multiple performers and drawing circuses played every turn). Things for playtesting. Night, $2 trash up to 2 cards from hand, each other player draws card/Action, $5 +3 Cards for rest of turn when trash card +Villager. Locksmith has the potential to be good and fun, so that's great. It feels stronger than Recruiter? So good that it's the bottom of a split pile, but Vigilante is a very conservative top; as identified, will it empty out in not just being a pure trasher but giving cards to your opponents as well? In a way it feels like you found the picture for Vigilante and focused the pile’s design around it; you've done well there, though I find that's not the best way to go for making cards that play effectively. Night, $3 choose two of +2 Coffers, trash card in play or Action from supply/Action, $6 +3 Cards choose card in trash, everyone gains copy, when you trash this gain Duchy. Tax Collector looks scary strong; trashing with Coffers is great for building an engine, together with the rush potential as you save up Coffers for Provinces whilst emptying the Supply. Hard to beat an opening of 2 of them. Earl's ability to give bad Actions out can further support the rush by disrupting the opponents’ engine or big money attempts. I'd need to see this tested to be sure, but I think this is doing quite a lot towards a single pile strategy, a bit like Rebuild in putting the whole game on a timer just by its presence. Not as oppressive probably. Night, $2 if discard empty gain up to $4 onto deck, otherwise Silver or Butler onto deck/Action, $4 +Action reveal top 2 from deck, play Treasure or night, play Action, put rest back (in any order). Butler is a gainer that puts gains onto deck for next hand; to start with it's often a Silver or Butler, but sometimes you'll be able to not buy anything (keeping empty discard) and get a better deal from a top-decked $4 (or more from multiple Butlers). Mansions can help Butlers gain better things, be a village or at best a lost city with some unique uses in playing Treasures and other Nights in the Action phase. You can get an interesting run of play going with this pile, not an engine as eventually the Butlers are going to get in the Mansions’ way a bit, come up at unwanted times. Amusing flavour-wise, but it means the function of the pile is rather limited. Night, $2 +Coffers may gain card onto deck cheaper than one gained this turn/Action, $7 gain Gold to hand. The main reason to get Markets early is the Coffers, by itself not much when compared to Ducat, though those Coffers can also help get something nice to top-deck. It'll get good things later, which helps with tfb or helping the deck be more resilient to the Provinces you add. Goose helps further with these uses. But overall, how contested will the pile be? It feels ignorable quite often, certainly Goose does by the time it's revealed. Night, $2 reveal discard, +Villager per differently named card revealed/Action, $4 +2 Cards, reveal top 3 from deck, non-Action to hand, discard any number, rest back. House can sometimes get a big number of Villagers, but it can't count the things played; it takes some skill and deck building strategy, or just uncontrolled shuffle luck, to pay off big. If neither Coppers nor Estates counted though, it wouldn't be something to get early so Hunter would rarely appear. The version in the original post, though, includes them, so whilst shuffle luck can still affect an early buy, more Villagers are available so as to be a good investment, possibly one House being all that's needed though. The synergy with Hunter is partly about the draw, partly about keeping the Villager supply up, so that's spot on. But I'll also have to say, negative points from the choice of theme. Night, $2 reveal from deck until number of Actions revealed equals Nights in play. Nights into hand, Actions back in any order, discard rest/Action, $4 reveal top 4 from deck, Nights into hand discard rest put rest back in any order. Reveal hand, +Card per Night. Dream can make a pure money Night deck work, having no Actions at all so as to draw all the Nights at once. That could be fun, or broken with certain things. With Actions it's a pretty good sift. Interpreter as draw will greatly benefit from other night piles, otherwise it'll be a thin scattering of Dreams it's trying to find, seeing how Dream and thus the whole pile initially favours low trashing. And sometimes the things you want to draw with Interpreter will have to be discarded with its reveal. My main snag with this pile is both parts of the pile revealing several things from deck, it'll be a long game IRL if the pile is contested. Edited, I read Interpreter wrong. That's irony, isn't it? Night, $3 look through discard and put up to 2 cards from it onto deck, when you buy gain up to a $4/Action, $5 +2 Cards may discard card to gain non-Victory card costing at most same. Campfire does the simple thing of harbinger at night, twice, so the turn's buys can go onto deck. It also lets $4s be bought for $3, quite a nice way to get the top of the pile sought after if it isn't too good a deal; this being a stop card with no payload benefit helps. Travelling Shop has definite synergy with Campfire; I feared it has unwelcome kingmaking potential, exaggerating a lucky early Province, but it does come late so the advantage won't be too much. The uses for a late non-Victory gainer are limited, but there's no denying how strong discarding a Province to it is. Action, $2 +Action look at top of deck, either trash it or put card from hand onto deck/Night, $5 either gain card costing up to $1 per different card in trash, or one up to $6 from trash, when you trash this put into hand. The Action is on the top! I feel this is a better way round than the Night on top, simply because the Action phase comes first and can affect the later Night. Lich isn't as restricted in its intended purpose as some of the other Nights here are, and is nice to pick up later. However: Donald never made an alt VP card affected by the trash, mainly because the efforts of one player trying to make it their strategy can give everyone the same advantage, so in reality nobody trashes. Similar will happen with Lich trying for Provinces, so it will mainly be either an occasional Rogue or Supply gainer. And Gravedigger on top, rather than helping Lich, I think it hinders it being revealed. It really won't take much to dissuade people getting this as such risky trashing. And again, I'll have to say negative points for choice of theme. Shortlist: Dynamite, Bear, Night Circus, Campfire. Winner: Night Circus/Performers by Gazbag. Runner-up: Dynamite/Dwarf by Shard of Honor. I feel kind of sorry that people missed reading my point on the theme of card, but overall it didn't affect the judgment much anyway. Gazbag's pile was my favourite overall with its diverse uses. And so the baton is passed! use the wording „reveal”. So it goes back first i think. I am using „revealing” as showing it but it stays on its place. I don't think reveal and looking at behave differently here. The topdecking of a card from your hand arguably happens during the instruction to reveal or look at a card, so there's a point in saying you'd have to put the revealed/looked-at card on top of the card from your hand. Compare Outpost trashing a Rats for the timing here. Yeah, sorry, Gravedigger should say to put the card you're looking at back before you put a card from your hand on your deck. I didn't think particularly hard about it because I don't like phase regression, but considering Bull will always appear under Bear, players can always dump Treasures in their Buy phases and regress to their Action phase. Bull should probably cost $6 (and maybe draw to 7). Night, $2 reveal from deck until number of Actions revealed equals Nights in play. Nights into hand, Actions back in any order, discard rest/Action, $4 reveal top 4 from deck, Nights into hand discard rest. Reveal hand, +Card per Night. Either way, because Dream is strongest around no trashing, Interpreter in a big way exists to buff Dream in games with light trashing so that you might try to dig them out. The Action is on the top! I feel this is a better way round than the Night on top, simply because the Action phase comes first and can affect the later Night. Most people put the Night on top because Night cards are fundamentally non-terminal. The top card either has to be non-terminal (Encampment, Patrician, Settlers) or needs some tricksy way of removing it (Gladiator) or at least a major incentive to removing it (Catapult trashing Catapult, as though Rocks are ever relevant) to make it possible to clear the top of the pile. I don't think reveal and looking at behave differently here. It behaves very different. First, you have to show a revealed card to your opponents which may change their decision and second, you gain a Coffers if you reveal a Patron. In comparison to Library, Jack of all Trades and Watchtower, I feel, Bull is still expensive, but I required to increase the cost to $4, because the +Buy is so strong on a Draw-to-X card. The $3 for Bear is intended. 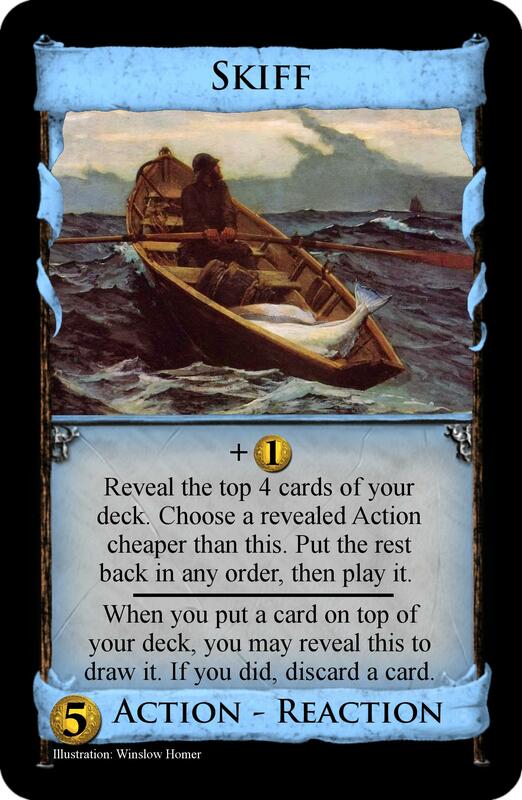 It seems to be a very bad card next to Coin of the Realm or Fishing Village, but the synergy with Bull is so strong, that it justifies the price tag. When you buy them, they are just junk cards throttling your deck down ... until the first Bull appears. However, if you are the only player, who buys Bears, you will end up with 5 garbage cards. I loved that idea, because it accurately simulates real stock exchanges. Apparently I didn't get the point across. The statement I quoted made it seem as if looking at the card did not implicitly place the card back to where it came from, if no place was specified, whereas revealing it would. But both do. There's no difference here. Wow sorry, misreading things twice. This is much more sensible putting the others back on top not discarding them. I don't think this would have changed how I rated it. Post has been edited. [...] but I wonder if Dynamite couldn't also target non-Copper things in play to make it a bit more exciting, and help justify it as a Night card a bit more? Wow, thanks. Didn't expect being runner-up. And good idea! Might be a cool addition and I don't think excluding Copper is even necessary as it only gains cards costing up to more. Sure, there might be some cost-reducers around, but I'll count that as kingdom specific synergy. You might want to check out my own fan-card creations, built with this. In a way it feels like you found the picture for Vigilante and focused the pile’s design around it; you've done well there, though I find that's not the best way to go for making cards that play effectively. I certainly did not do that! I usually just slap on any picture I can find on the great Google once I'm done with my card idea. I think the problem was simply that I made a bad card. You're definitely right about the top five possibly not emptying. I would have redone it with something to make the pile empty faster, but I got busy and never got around to it. Design a card for a hypothetical big 2nd edition update of any non-Base/Intrigue expansion. It would also be nice to have an explanation of what gap it fills (e.g. there's barely any draw in Prosperity) or a card that it's trying to replace (like how Bandit is a clear Thief replacement). Okay, let’s give it a try. Reveal the top 4 cards of your deck. + $1 per differently named card revealed. Discard any number and put the rest back in any order. Harvest is a horrible terminal money card and has the same problem, Adventurer had. Normally, Harvest is just terminal +$3 or +$4, which is pretty bad for a card costing $5. For this price tag you get much stronger terminals like Merchant Ship, Wharf, Patrol and Torturer. The biggest problem, however, is the discarding thing, which makes you feel bad, if your strong cards are discarded and miss the current shuffle. Vintage is a reasonable Navigator/Cartographer variant, keeping the idea of Harvest, but fixing its weaknesses. With the correct engine, you can guarantee to get a terminal +$4 and you don’t have to be afraid that your Gold is discarded. 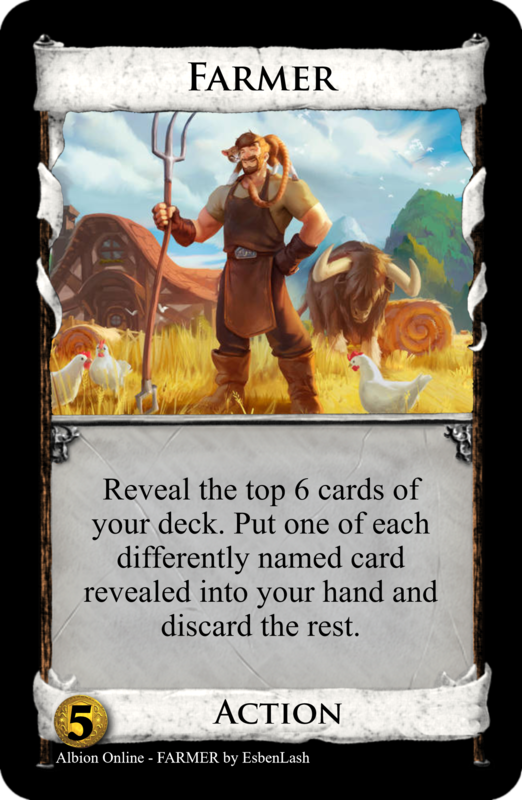 Vintage also has some synergy with other Cornucopia cards like Hunting Party and Menagerie, if you have support by villages. 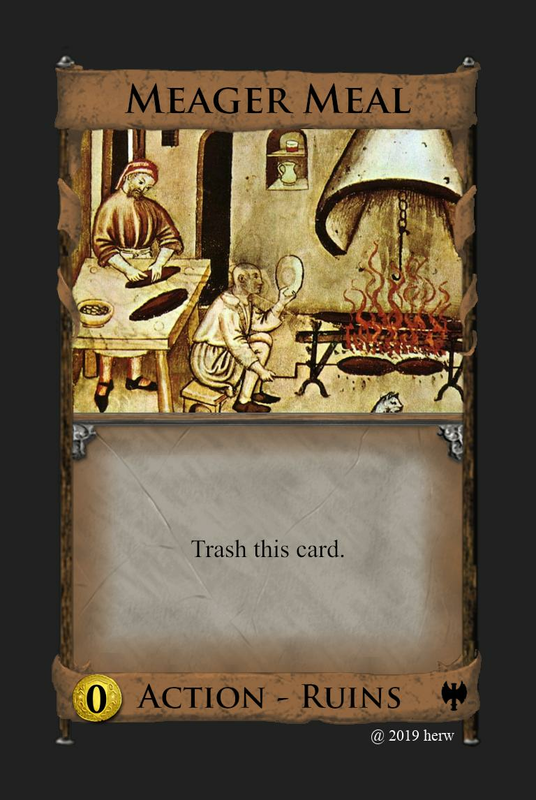 You may trash a Treasure card from your hand. If it is a Silver, gain a Gold. When you gain this, discard the top Boon, and if it doesn't give +1$, each other player receives it. Fool replacement. I named it Mime so it can be confused with Mint and Mine. Not sure it needs the penalty, but it was the best way I found to give it Fool's Boon aspect without it being a major pain. Meant to replace Cultist. This should eliminate the luck factor of whoever happens to get a few Cultists strung together first wins. It should still be a good attack, but a lot more fun to play with/against. It isn't necessarily a worse card though, since it turns into a lab later in the game. I also got rid of the on trash bonus because although it's a really cool bonus, it just doesn't need it at all. 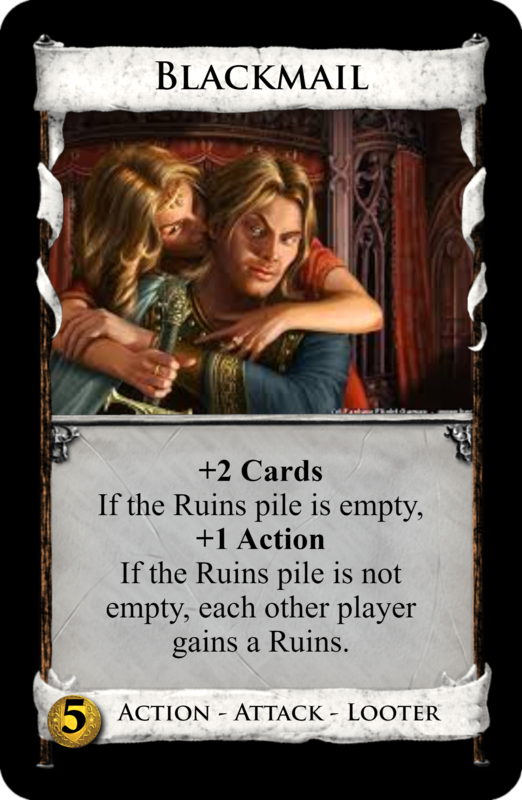 Side note, it would be super fun to play a string of these with an empty ruins pile and then return a Ruins or two to the pile with Ambassador to (hopefully) ruin your opponents turn. Privateer replaces Pirate Ship. It eliminates the need for coin tokens in Seaside. Also, instead of being an attack that often benefits your opponent, now it embraces that aspect and only benefits your opponents. But you can still profit. 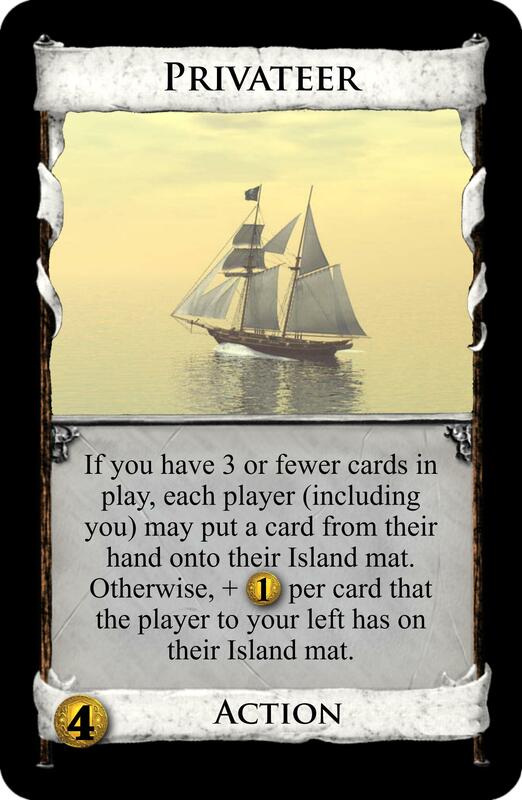 We also get rid of the choice in order to make gameplay faster and to prevent engines that draw your deck and play a Privateer at the end to remove a Province. Good thing it also does something similar to Mine! Increases confusion. It is neat that this interacts with Lucky Coin's Silver gain, but I still feel the two are somewhat at odds. Lucky Coin is best in sloggy games, and Mime is a trasher. Look at the bottom card of your deck. 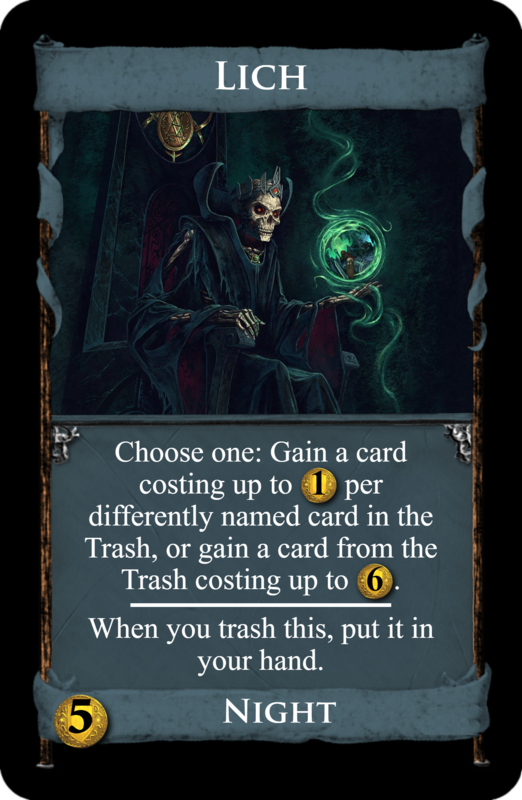 Either trash it, or put it in your hand and put a card from your hand onto the bottom of your deck. My original idea was to have it do something similar to both Mine and Mint. I'll try to make it even worse... err... better. This is to replace Navigator. You can discard or put back the cards you look at, and it's non-terminal in a niche, hopefully interesting kind of way; there are lots of cheap Actions in Seaside. And a complimentary reaction that might interact with too many things. Tried a few wording shortcuts to make things less wordy, but is it understandable? Edit: Reaction discards a card rather than puts one back on deck, and on-play is down to + $1 and only putting the other cards back. Farmer is meant to replace Harvest. All of my fan card mockups are credited to Violet CLM and his/her Dominion Card Image Generator.